Sinclair Family Law Solicitors » Divorce & Family Law Blog » Sinclair Law Solicitors further expand their Private Client practice with the qualification of a new solicitor. Sinclair Law Solicitors further expand their Private Client practice with the qualification of a new solicitor. 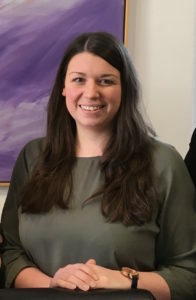 Samantha Kennedy recently completed her training contract with Sinclair Law, qualifying into their Private Client department where she specialises in estate planning, Will drafting, Lasting Powers of Attorney, asset protection and estate administration. Samantha is passionate about providing a high quality and tailored service to her clients. With 4 years prior experience within this sector, she understands the importance and care which must be taken when dealing with each client’s needs. Sinclair Law are wholly focussed on the pursuit of well rounded bespoke personal legal service to private clients. Understanding the importance and the difficulties surrounding this topic, Samantha and the team offer a friendly, approachable and dedicated service. Preparing a Will is not usually an easy area of discussion but with their breadth of knowledge, Sinclair Law are able to advise on a broad spectrum of matters. Estate planning and Will drafting provides clients with security and peace of mind for the future. A Will is not “one size fits all” and as such all areas for concern are discussed with clients including, care home fee protection, trusts for disabled beneficiaries, business assets and inheritance tax. Together with pre-death planning Sinclair Law also deal with the administration of Estates, obtaining grants of probate and administering trusts following the death of a loved one. Using their knowledge of how things work in practice to provide clients with options to suit their needs.